Complaining is big these days, whether it be about the weather or a shady company you worked with – the age of the internet gives everyone a voice and access to others all over the globe. With that being said reviews, complaints, and reputations mean even more than they did before. A reputation can be made or broken in a day, whereas before the internet it took time and work to spread the word around. 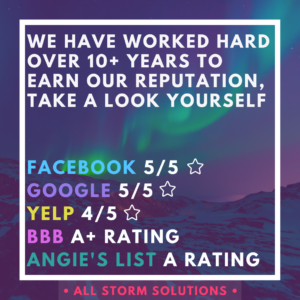 All of All Storm Solutions reviews show how well word spreads in communities about us, many reviews and positive feedback being from homeowner referrals for us to help in their time of need. Some companies fear online reviews, being able to point out their flaws and shortcomings. But we embrace it all and because of that have some of the best rated profiles and reviews for anyone in the industry in our marketplace. Since 2012, every year All Storm Solutions has received the No Complaint Award from the Better Business Bureau – that’s 7 years and counting. It may seem like a niche award to some, but the BBB is an organization many homeowners, property owners, and decision makers trust and look to know if a company is to be trusted as well. Not to mention we hold the highest rating with the Better Business Bureau with an A+ score. Even though some may not think so, the Better Business Bureau exists for YOU, the consumer. While we enjoy our relationship with them and are very proud of our profile/reviews – they are there to serve you not us. If you have complaints or any sort of a feedback on a business, that is what they are there for. They have teams fully dedicated to dealing with reviews, complaints, and con reports and regularly post on social media and blogs about different cons to watch out for or trends in business, for example their most recent blog post “Scam Alert: When a Free Health Screening is Really a Con”. 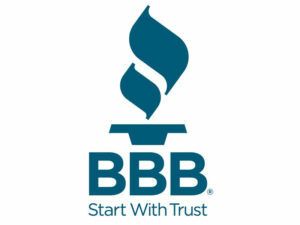 The Better Business Bureau is just one place to learn about our reputation and read reviews of our projects. We also have a perfect 5 out of 5 stars on both our Facebook and Google Business review pages, as well as an A rating on Angie’s List and 4 out of 5 stars on Yelp. Click the image above or click here to learn more about some of the highlights of our review sites. If you are an old customer of ours feel free to share your experience on any platform you choose! Have you not worked with us before? Fill out some quick information on our contact page and we will get back to you to schedule an estimate appointment on your home.